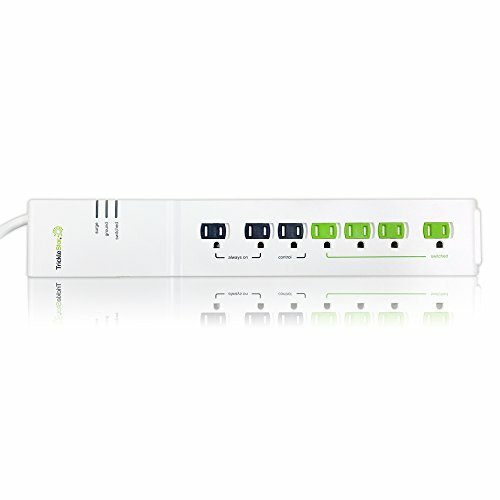 Tricklestar's 7 outlet advanced power strip includes 1 Control Outlet, 2 Always On Outlets (1 outlet transformer spaced), and 4 Switched Outlets (1 outlet transformer spaced) with an angled space saver plug. It has selectable switching thresholds 10W / 22W / 42W with ceramic surge protection. Power strip has LED status indication lights (Ground, Surge Status, Control, Switched Outlets). 15A resettable circuit breaker. 72,000 Amps / 1080 Joules. <40dB noise filtering. If you have any questions about this product by TrickleStar, contact us by completing and submitting the form below. If you are looking for a specif part number, please include it with your message.